It's a huge card, but what it lacks in compactness it makes up for in noise reduction and cooling. We all know about the 4870x2, it was the big and beastly twin-GPU offering from AMD that stole the show at the high-end. It was this card, even more so than the 4850, that really cemented AMD's return to form on the graphics front – proof positive that its decision to go modular rather than monolithic with its chip architecture was the right one. So why the hell should we care about another overclocked version, especially in light of the fact that the faster GTX295 is now clogging up the high-end graphics market? The interesting thing about Palit is that although it's not seen as a particularly big brand over here, it's huge out in the East; selling more units than you've had 419 emails. This means that its production facilities are pretty chunky as well, allowing it to redesign and manufacture its own versions of the reference graphics PCBs. 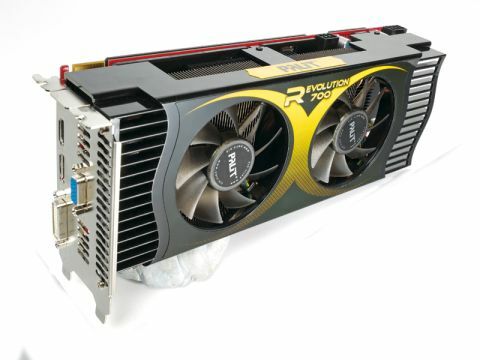 The R700 Revolution is one such card and comes with completely redesigned cooling to boot. The Revolution isn't clocked much higher than any other overclocked 4870X2 we've had pass through our test rig. Out of the box it comes with a fairly standard GPU clock of 790MHz, but a speedier memory clock of 950MHz. And it's not really going to garner you much in the way of performance benefit over a standard OC X2 either. So what, you may ask, was the point of creating this extra-huge, triple-slot monstrosity? Well, if you've ever heard a PC with a 4870x2 running, then you'll know they're not the quietest cards on the planet. The triple-slot design and twin-turbine cooling setup means the Revolution runs significantly quieter than a card fitted with the standard chiller. However, the main point isn't about the aural-abuse, it's about the heat. You see, the standard 4870x2 is a hot-headed beast at the best of times, but most of the overclocked editions have used the same reference cooling design and therefore ran incredibly hot. I used to run an overclocked X2 in my home rig, but after a few short months the cooked chip started throwing up BSODs every couple of hours. In our tests, Palit's R700 was idling at 45°C and topping out at 69°C. Compare that to Asus' TOP edition, which ran at 75°C and 88°C respectively, and you can immediately see the difference this design brings. So, while it's obviously not worth making a switch if you've already got an X2 card in your rig – assuming it hasn't recently fried itself – anyone looking to fit themselves up with the power of AMD's twin-GPU lovely would be a fool not to pick up Palit's triumphant card.